WaterAid is currently carrying out a SHARE-funded action research project in Zambia and Uganda in collaboration with WEDC and the Leonard Cheshire Disability and Inclusive Development Centre (LCD), called Undoing Inequity: water, sanitation and hygiene programmes that deliver for all. The project aims to generate rigorous evidence about how a lack of safe water, sanitation and hygiene (WASH) impacts on the lives of disabled, older persons and people living with a chronic illness; understand the barriers they face, develop and test an inclusive WASH approach to address those barriers and influence key policy and decision makers to mainstream inclusive WASH within development. As part of this project, Hazel Jones (WEDC) has written a report titled Mainstreaming disability and ageing in water, sanitation and hygiene programmes. This report recognises that progress on the MDGs is not happening in an equitable way. A drive for increasing coverage of basic services, such as WASH has meant that people who are ‘harder to reach’, such as disabled and older people often remain un-served. This report presents an overview of the extent to which disability and ageing is mainstreamed in WASH programmes. 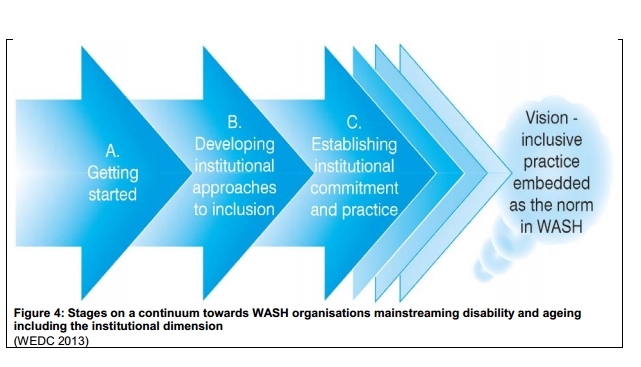 Drawing on experiences from WASH organisations around the world, it is evident that disability and ageing have received increased attention in the WASH sector over the last decade, but there is still a long way to go to achieve genuine mainstreaming. The current picture is of a ‘continuum’ of progress towards mainstreaming. This continuum provides a framework for WASH implementers to analyse their own equity and inclusion activities. With further refinement, it could also provide a practical tool for use by implementers in reviewing progress, and planning next steps in mainstreaming disability and ageing within their organisation and programmes. This entry was posted in Africa, Dignity and Social Development, Publications, Research and tagged ageing, disability, SHARE Consortium, Uganda, WaterAid, WEDC, Zambia. Bookmark the permalink.